So much of what we see on television and movies, in magazines, and online is geared, whether intentionally or unintentionally, toward making us feel bad about ourselves. We think if we could only be skinnier, prettier, or richer, we would finally feel good about ourselves. But we won’t find the love we need if we keep looking for external validation. We need to look inward for that, according to bestselling author Ilchi Lee. In his books, Earth Citizen and Earth Management: A Dialogue on Ancient Korean Wisdom and Its Lessons for a New Earth, Lee writes about how hope for the future of our planet and mankind is tied to learning to care both for ourselves and the world around us. Learning to love ourselves can be a hard lesson at any age. Sometimes, creating feelings of self-approval can be as easy as turning on some inspiring music. Music has been important to mankind since the beginning of time, and it continues to be a universal way of expressing and exploring our feelings. 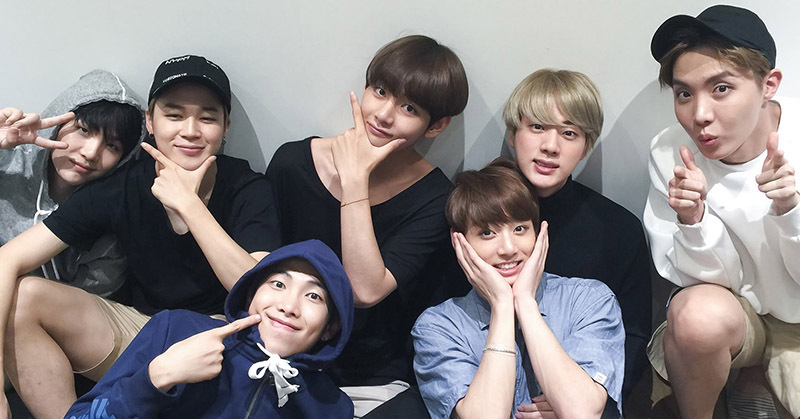 A K-pop group, BTS, also called the Bangtan Boys or, now, Behind the Scene, is one of the groups that is leading the charge for self-approval with songs that remind people to feel good about themselves. The South Korean boy band has seven members and has scored big with fans with hits like “Love Myself,” which carry messages many of us could benefit from. When you feel bad about yourself, you don’t feel love for yourself. That doesn’t only impact you, however. It can be hard to make connections with the people and places around you as well. You don’t feel as if you are worthy of the love of others—you can feel disengaged and isolated, so you push them away. It’s hard to want to improve mankind and the world around you when you have so many feelings of negativity. That’s why it’s crucial to find a way to look inward, like what you see, and realize you can make a difference when you accept all that you are—and even all that you aren’t. Loving yourself opens you up to loving others, feeling empathy, and wanting to work toward the greater good. Instead of feeling isolated, you begin to feel as if you are a worthy and valued member of a team. But the first step to loving yourself is getting to know yourself. That involves peeling back the superficial layers many of us use to describe ourselves and looking at our core beliefs and goals instead. Lee loves the message BTS is trying to put out for its audience—that they shouldn’t wander in search of love. Instead, they should look internally for that love. And once that love is unlocked, your heart and mind will be in synch so you’ll be able to use your brain to its fullest capacity. Many people mistakenly think their brain isn’t worth much. They can feel inferior or even dumb because they didn’t do well in traditional school. But there are all different kinds of intelligence. And having emotional intelligence is every bit as important, if not more important, than the lessons you’ll learn about math and science in school. After you find a way to love yourself, Lee said, you also learn to heal yourself and teach yourself by using brain power. You begin to believe in yourself, knowing you can do things you once thought were impossible. 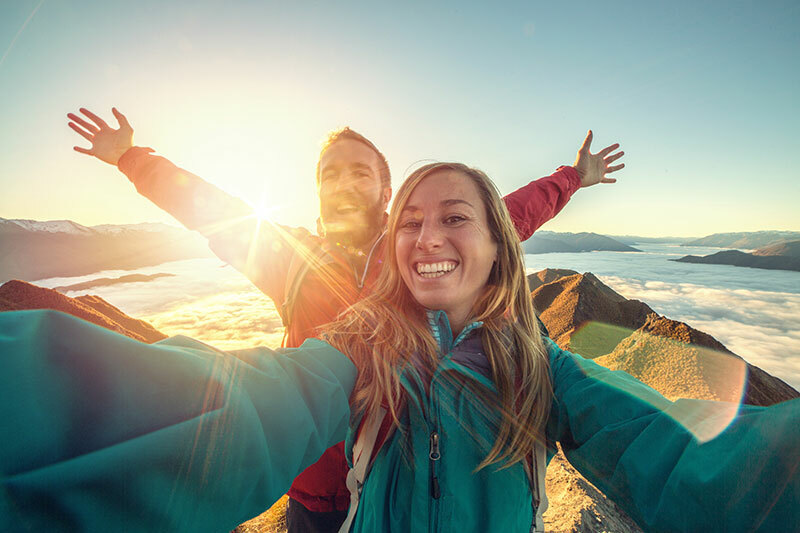 By learning to love yourself, believing in yourself, caring about others, remembering you are part of the bigger picture, and unlocking the power of your brain, you can achieve great things—both for yourself and for the world. Ilchi Lee has always looked for simple ways people can maintain their health on their own. He maintains that we need to take responsibility for our own body, mind, and spirit. Lee has created many mindful exercises in order for individuals and communities to accomplish this. They are all bundled into his Brain Education method. But he’s also created new ways of thinking about health, as well as non-profit organizations that promote healthy, mindful, and sustainable living using his methods. One of these is the Earth Citizens Organization (ECO). From its U.S. headquarters in Cottonwood, Arizona, ECO trains leaders who bring Ilchi Lee’s important lifestyle tools and philosophy to their local communities. 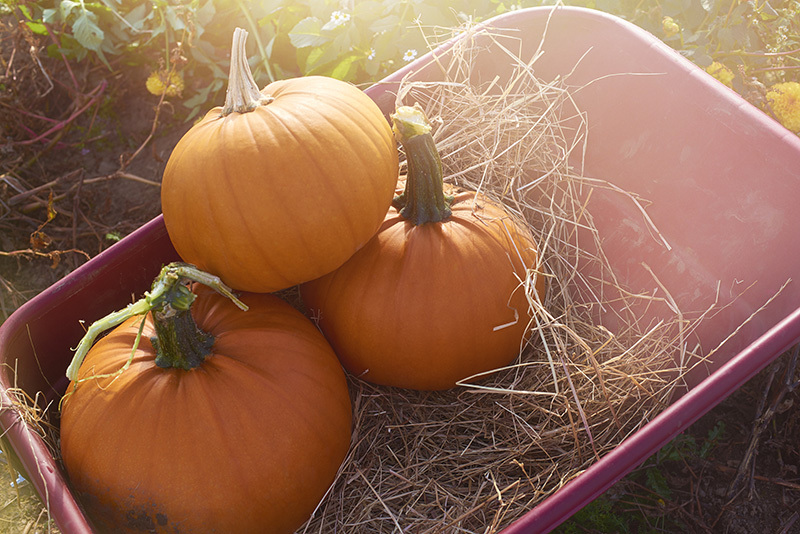 As part of this effort, ECO started its SEED for Health national campaign this year. The premise behind SEED for Health is that it only takes making small changes to your lifestyle to create big results. The campaign provides ways to manage four key areas of health, your SEED: Stress, Exercise, Emotions, Diet. It is spreading these seeds of wisdom through ECO’s online and offline networks. 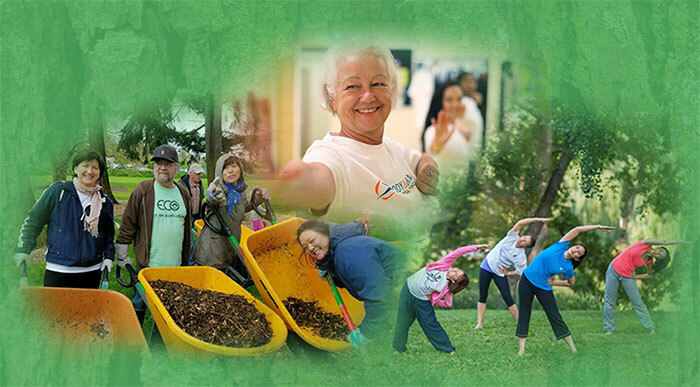 Local ECO leaders are actively promoting SEED for Health through Healthy Living events in conjunction with Body & Brain Yoga and Tai Chi centers and through donations of Ilchi Lee’s book on healthy living, I’ve Decided to Live 120 Years: The Ancient Secret to Longevity, Vitality, and Life Transformation. Watch ECO’s campaign video if you’d like to learn more about SEED for Health or visit the campaign website, SEEDforHealth.org. What Is Earth Management According to Ilchi Lee? One of the primary jobs of an Earth Citizen is Earth Management. 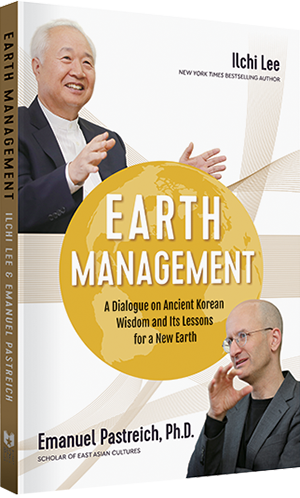 Ilchi Lee explains what Earth Management really means in this excerpt from his book, co-authored with Dr. Emanuel Pastreich, called Earth Management: A Dialogue on Ancient Korean Wisdom and Its Lessons for a New Earth. Here is an excerpt from the book that can get you excited about Earth Management. Earth Management means seeing the earth as something to be managed. Not in any era of human history has anyone talked about Earth Management. The earth has only been perceived as an object to be exploited for resources and developed for human wealth and convenience. It has been seen as something to plunder to power this industrial civilization and this capitalistic system. As such, it has degenerated into a dump site, a receptacle for all kinds of pollutants. Now, we are experiencing the consequences of this dangerous perspective. The earth’s crisis is a life crisis. We must look at the earth as an object in need of management. To make the planet sustainable, we need a form of management capable of giving birth to a new civilization that fosters coexistence. People, groups, and nations must rise to the challenge of managing the earth. Perhaps it would be easier if I call it environmental management. Earth Management is a form of management centered on the global environment. We could even call it “nature management.” Earth Management, environmental management, nature management—these all mean the same thing, but what is essential is that it must include people. As Gus Speth, the environmental scientist Professor Pastreich mentioned previously, has said, global problems, environmental problems will no longer be solved by clinging in a limited way only to the environment and the earth. People are the ones who caused these problems. A fundamental solution to environmental problems is impossible unless there is a change in the consciousness of people, the ones contributing to them. As little as a century ago, the largest unit of organization, and people’s major focus of attention, was the state. At that time, there was no need for something called “Earth Management.” It was enough if your country, and only yours, became wealthy and powerful. That’s why imperialism predominated back then, with some nations ruling other countries or peoples with their strong economic and military power. Now, though, with the development of transportation, information, telecommunications, and industry, we’ve already transcended national borders and are moving into the era of a global village. We can immediately see what’s happening on the other side of the globe right now with our own eyes through TV or the Internet, while we drink drinks and wear clothes of the same multinational brands. However, our consciousness remains trapped within the confines of the old belief systems defined by national borders. Although the reality has changed, we have been unknowingly trained in these beliefs by our countries, cultures, and religions our entire lives. Far too many barriers block our way to a single global village in the truest sense. The environmental crisis facing the human species right now, however, can no longer be solved by regional and organizational selfishness. Damage due to environmental destruction, such as global warming, desertification, and biodiversity loss, has already gone beyond national borders and is having an impact globally. To solve these problems, we now need Earth Management, which sees the earth as united and approaches issues on a global level. For over 35 years, Ilchi Lee has been brokering a change in human consciousness, a shift from the artificial to the natural, from the material to spiritual. His motivation is a vision of two futures for the earth he could see while in deep meditation. One future showed chaos and destruction; the other showed peace and abundance. In that moment, Ilchi Lee realized that human beings were the main drivers toward each possible future. The future of the earth is in the hands of humanity. What will happen is our choice. The best way to switch one’s consciousness to an Earth Citizen mentality is not to read about it or think about it, but to experience it. 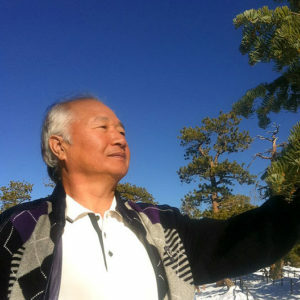 Through the mind-body-spirit training Ilchi Lee has developed, it’s possible to feel one with the earth and with all of its inhabitants. This kind of personal, visceral experience solidifies the ideas of the mind and makes them one’s own. It generates the conviction that motivates a person to act. However, if someone is anxious about their next meal, feeling depressed, or facing a health crisis, it’s difficult to worry about the earth. 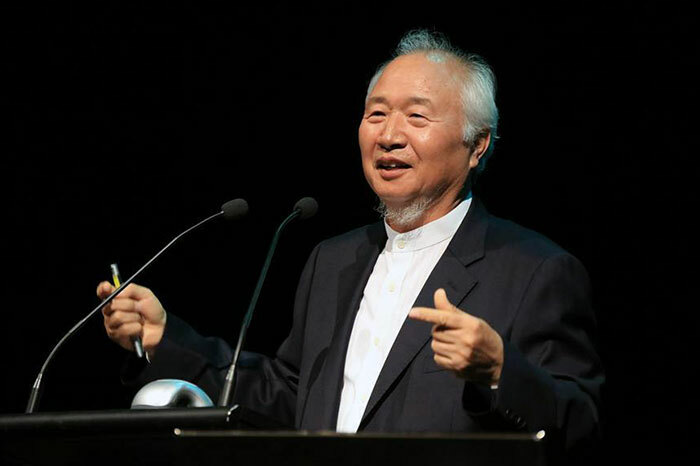 The first things Earth Citizens need to manage, according to Ilchi Lee, are their own physical health, mental health, and spiritual health—or what he calls their physical power, heart power, and brain power. Being able to take care of the body, release negative emotions, be in tune with heart and soul, and choose a purpose for one’s life is necessary for living as an Earth Citizen. Once they achieve this, Earth Citizens are free to help others achieve it as well and work more proactively for the benefit of the planet. 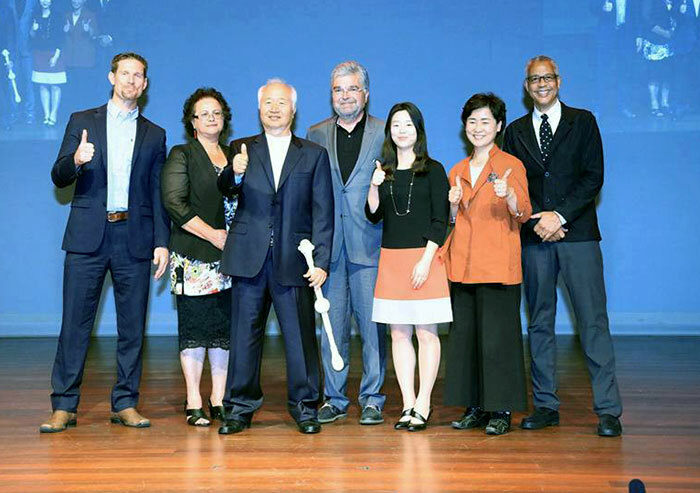 As more people choose the positive future Ilchi Lee envisioned, a supportive Earth Citizen culture will be created that will make it easier for all people to live in harmony with each other and the earth. 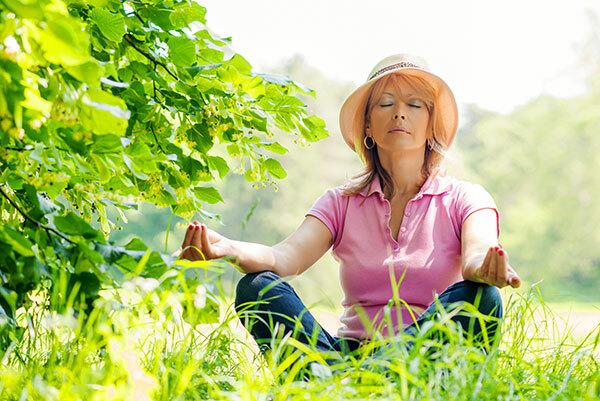 To learn simple exercises for living a long life as a healthy and happy Earth Citizen, visit ChangeYourEnergy.com, an online educational resource founded by Ilchi Lee. 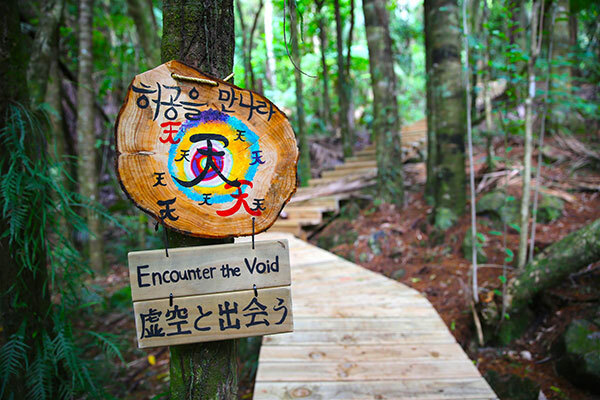 At Earth Village, guests and residents can feel what Ilchi Lee calls their true selves more easily with the help of the pristine, natural setting. It is also a community where they can live authentically based on this discovery. 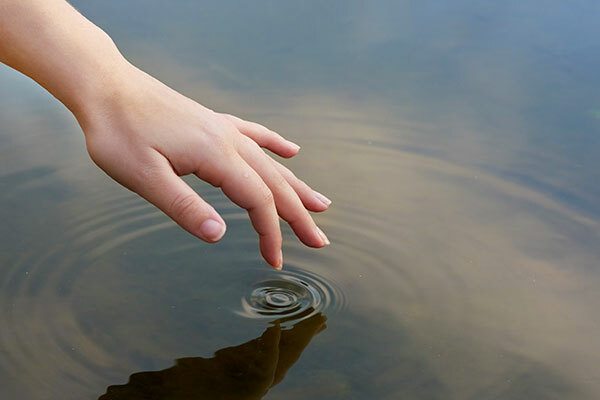 To do so and “transcend their small selves and begin to embrace others and the world” is what it means to be an Earth Citizen, according to Ilchi Lee. Earth Citizens also live with a purpose and vision for their lives, for their entire lives—regardless of their age. To help people begin their journey to becoming an Earth Citizen, Ilchi Lee developed a walking path called The Way of New Life. The course includes a wooden stairway through the forest of 120 steps, with each step representing a year in a 120-year life—the number of years scientists think human beings may have the potential to live. While visitors climb the first 60 steps they reflect on their lives so far, and let go of any mistakes they have made, regrets they have, or ideas that no longer serve them. They also consider what their goals for material success are. During the second 60 steps, they look to the future and envision their spiritual development and success. A broad wooden deck in the middle represents a transition period between these two hypothetical stages of life. Ilchi Lee calls “the first 60 years your congenital destiny and the next 60 years your acquired destiny. Your congenital destiny is the destiny you were born with and the one the world has constantly imposed on you, and your acquired destiny is the destiny you create for yourself by your own choices and effort.” The Way of New Life opens the trail for a new acquired destiny. By reflecting on our lives in this way while on this path, we not only paint a broader vision for our future, but become better able to derive new meaning from the small moments of our daily life. We get a picture of the whole forest in addition to the trees and learn what it is we truly want. 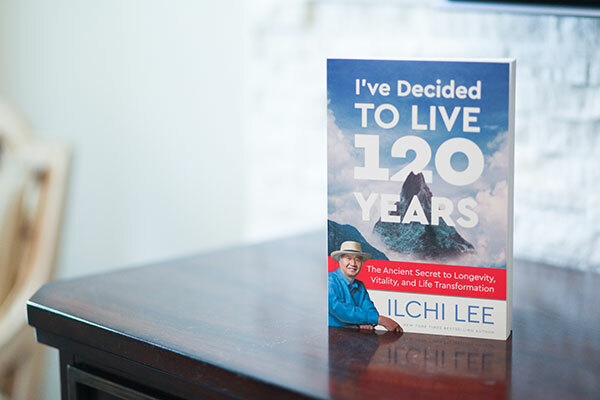 The Way of New Life is a trail Ilchi Lee has blazed to make it easier for all who travel it to discover their value and gain the courage to express it in their lives. 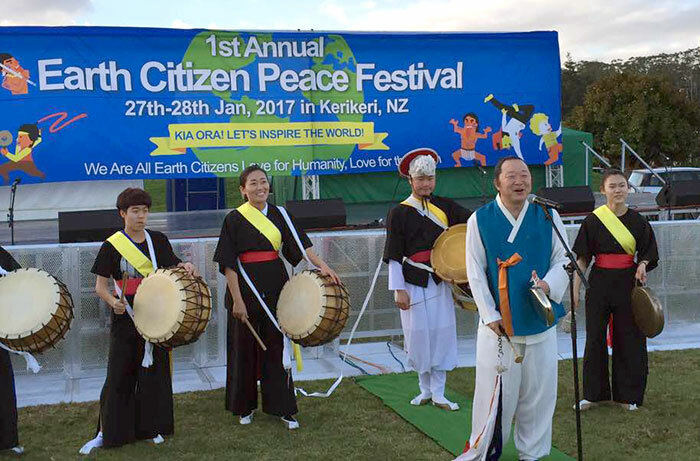 The 1st Annual Earth Citizen Peace Festival brought together 1000 people from around the world in Kerikeri, New Zealand. And we bring you the highlights! Friday night, January 27, 2017 was an outdoor fair with performances, food, and a raffle. 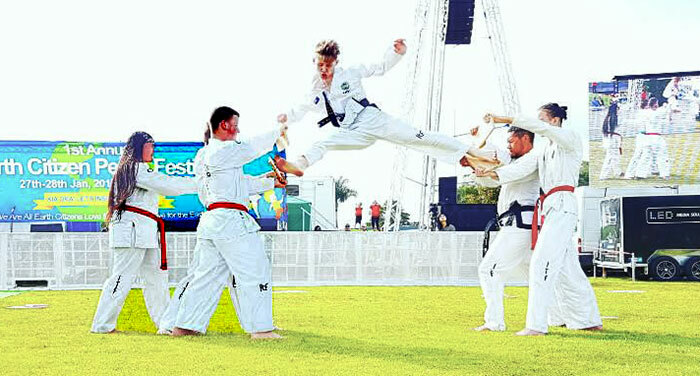 Local dance groups were joined by dancers from the United States, the United Kingdom, and South Korea, martial arts performers from South Korea and the UK, and South Korean drummers. The morning of Saturday, January 28, 2017 was the main event, Earth Citizens Come Together. 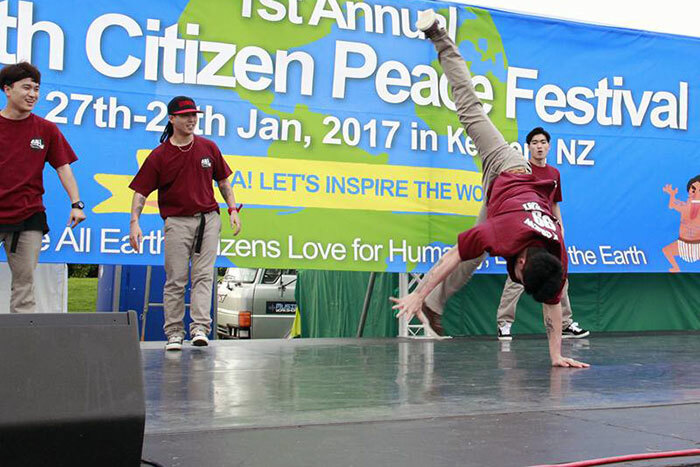 It began with cultural performances from a Maori performance group and a South Korea breakdance crew. Congratulatory messages followed, and the Deputy Mayor of the Far North District Council, Tania McInnes, gave her support for Earth Citizen values in a speech. Then Ilchi Lee gave the keynote lecture, and representatives from nine countries recited the Earth Citizen Declaration. In the afternoon, a symposium was held called The Brain, Earth Citizenship, and Our Global Future. 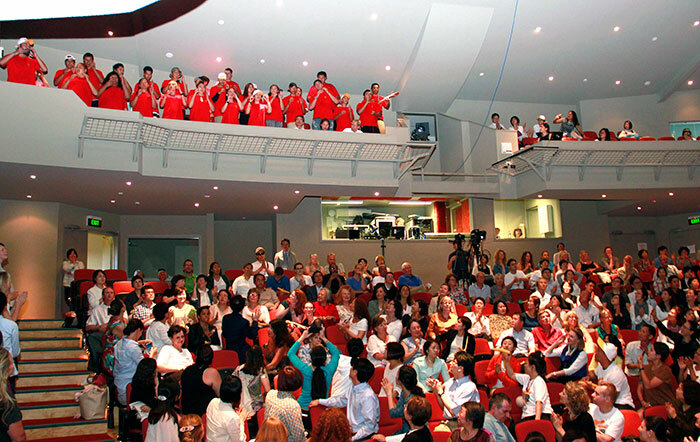 At the end, members of the Body & Brain Yoga center in Auckland sang a Maori song, and then the Global Scholars Society for Earth Management was founded. 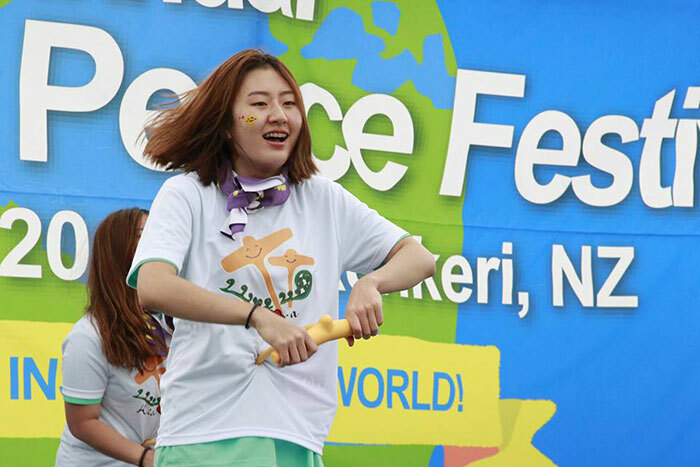 The Earth Citizen Peace Festival felt like a big reunion where people were inspired to do more in their communities to tell others about Earth Citizenship. It strives forward, the Earth Citizen Movement that Ilchi Lee created, gathering more and more people who understand that they are not just a citizen of one particular country and not just a member of any one group—they are citizens of the earth. They love the earth and want to take care of it. 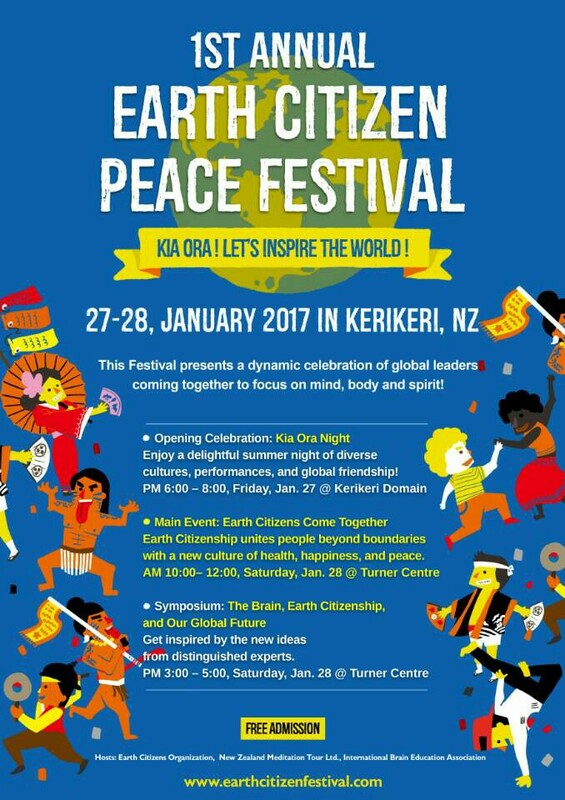 At the 1st Annual Earth Citizen Peace Festival, which will be held in Kerikeri, New Zealand on January 27-28, 2017, the meaning of being an Earth Citizen will be celebrated. Among the festivities, however, is a symposium that will expand our ideas of Earth Citizenship. It will explore the intersection between being healthy naturally, the importance of the gut to overall well-being, the power of the brain, and solutions to the problems facing humanity and the planet today. 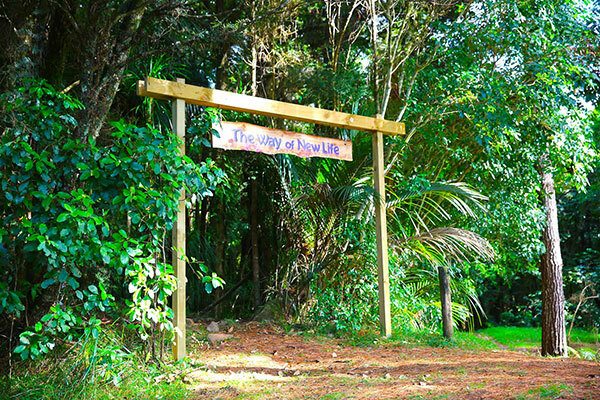 The small town of Kerikeri on the North Island of New Zealand was also chosen by Ilchi Lee as the site of a new Earth Village, where Earth Citizens from around the world can learn and practice an Earth Citizen lifestyle—one that is in harmony with the earth and everything that calls it home. 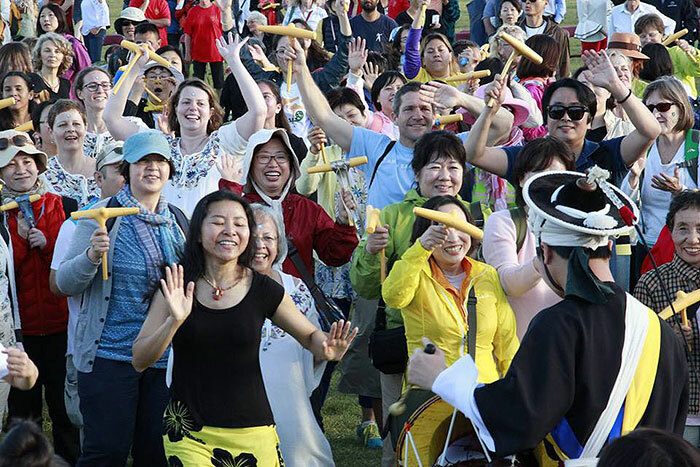 The pristine and amazing natural beauty and Maori cultural heritage that New Zealand is known for come together in Kerikeri; it is a place where, Ilchi Lee says, nature’s energy is strong and you can feel your own true nature easily. 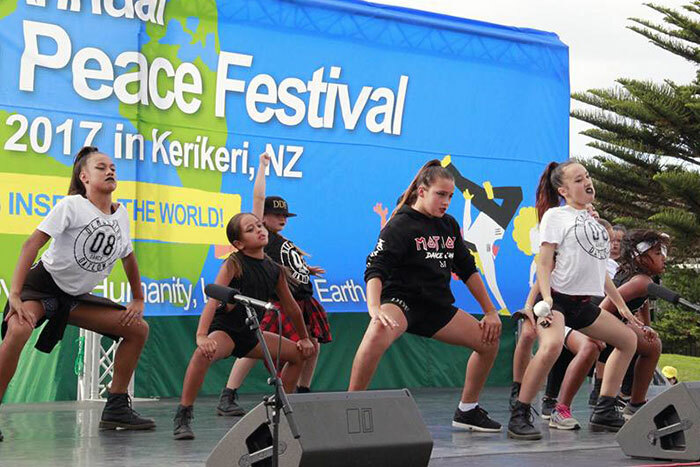 The Earth Citizen Festival will introduce Kerikeri to the world as an Earth Citizen hub. 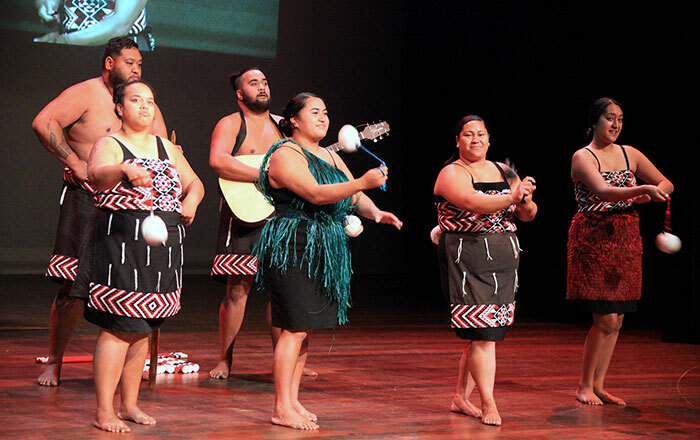 With the festival title, “Kia Ora: Let’s Inspire the World,” the organizers hope the festival will inspire the people of the world to keep the earth and its people healthy and well (kia ora is a Maori greeting that literally means “be healthy/well”). This wish has driven Ilchi Lee and the Earth Citizen Movement to where it is today. 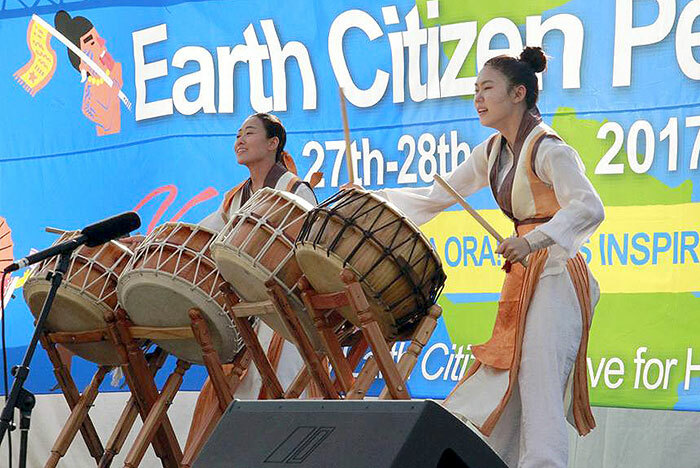 The Earth Citizen Peace Festival is hosted by the Earth Citizens Organization (ECO), the International Brain Education Association (IBREA), and Meditation Tour LTD. 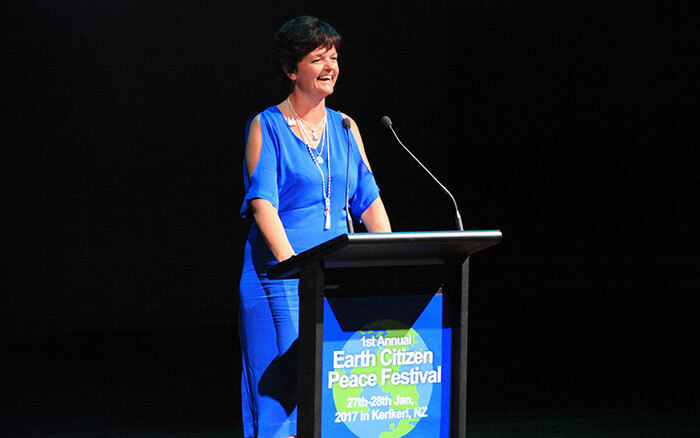 These non-profit and for-profit organizations are major players in the Earth Citizen Movement and/or the development of the Earth Village in Kerikeri. To learn more about the Earth Citizen Peace Festival, visit its website at EarthCitizenFestival.com.